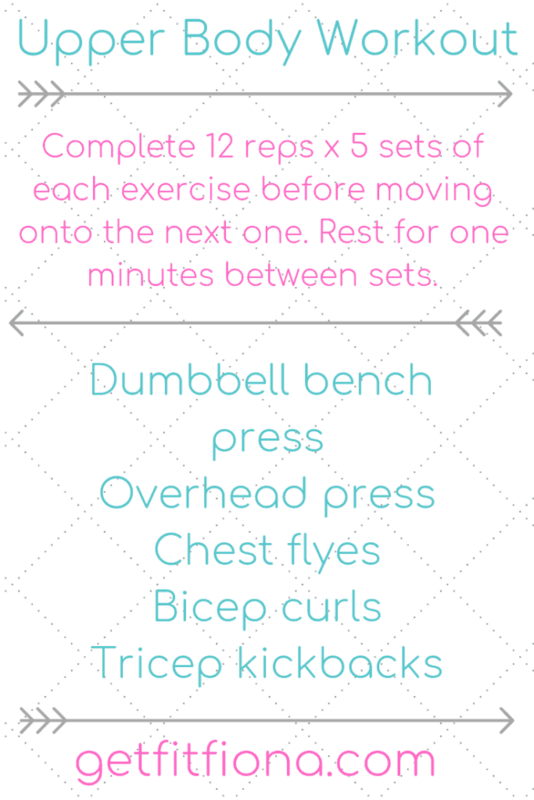 Today I’m sharing an upper body strength workout. Good morning! I hope you all got more sleep than I did last night. I stayed up late reading The Pillars of the Earth (affiliate link). I kept telling myself I’d only read to the end of the chapter, but then I couldn’t put it down. I love big, epic books, and Pillars of the Earth definitely fits that bill. It’s actually the first book in a trilogy. I already have the second book, World Without End (affiliate link), to read, and I have a gift card that I got for Christmas that I’m going to use to buy A Column of Fire (affiliate link), the last book in the series. All three books focus on the village of Kingsbridge in England during medieval times – first with the building of the cathedral, and then following the residents of Kingsbridge. What good books are you reading right now? I’m always looking for suggestions. I’ve listed some of my favorite books on my books page here. And now onto today’s workout. This upper body workout can be done at home if you have a couple pairs of dumbbells – you’ll want to use heavier ones for the bench press and lighter ones for the tricep kickbacks. I like these ones (affiliate link) from Amazon. Starting with the first workout, you’ll do 12 reps and three sets before moving onto the next exercise. Between each exercise rest for 1 minute. As for the weight that you should be using, use one that will be challenging but you can still have proper form on the last rep. It’s tempting to go with a higher weight, but correct form should be your top priority. For more workouts, check out my workouts page. I have them organized by body part (upper or lower body) and type of workout (cardio, strength, HIIT). With a pair of dumbbells sit on a bench, and slowly lay down. Bring the dumbbells straight over your shoulders with your arms extended. Slowly bring them down to your torso and then up back to the starting position. With a dumbbell in each hand, lie on a bench or the floor with your elbows slightly bent. Move the dumbbells in a semi circular motion above you until they meet directly above your chest. Return to the starting position by moving the dumbbells with control so that your arms are extended again. With a dumbbell in each hand, flex at the ankles, knees, and hips so that your torso is leaning forward slightly. Bring your arms close to your body with your elbows back slightly. Start with your forearm in a 90 degree angle to your upper arm and slowly extend your forearm until your entire arm is straight and your triceps muscles are contracted. Slowly reverse the movement so that your arm is once again at a 90 degree angle. Talk to your doctor before beginning to workout. Honor your body and modify this workout as needed for you. This post contains affiliate links. Thank you for supporting my blog – I really appreciate it!